I have never really had the need for data recovery software until recently, when I mistakenly deleted a bunch of data off of a USB thumb drive, thinking I had backed it up somewhere. Much to my chagrin, I had not in fact backed it up. There were some files I was really going to miss, such as recordings of music I had made in Logic, and some various photos I’ve carried around with me over the years. As I quickly learned, these type of apps do not run cheap. 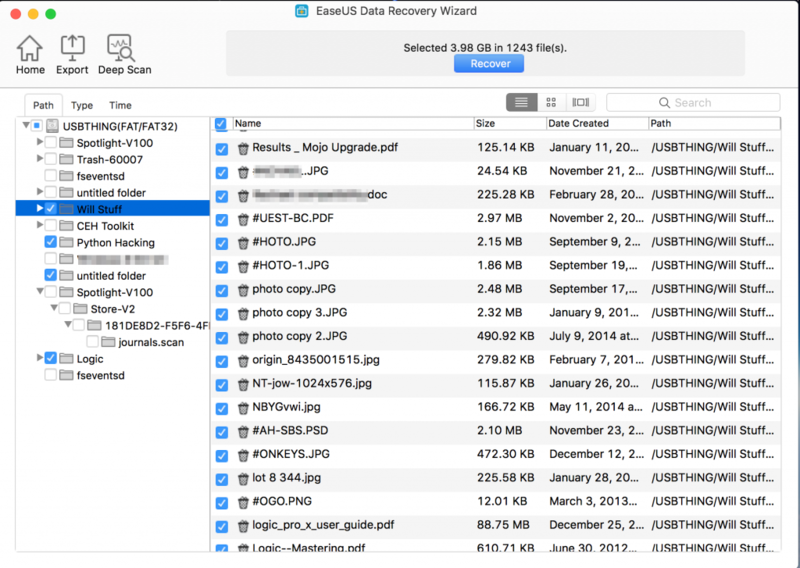 After doing some digging, I ran across a promising candidate called EaseUS Data Recovery. As far as data recovery software goes, they seemed to have been around a while, and had some good reviews. At $89.95, though, I expected it to do great things. Not only did I want Mac data recovery, I wanted a tool that would let me recover data from external hard drives, USB thumbs drives, and more. EaseUS promised to do that. There were a few concerning things that happened during the installation process. 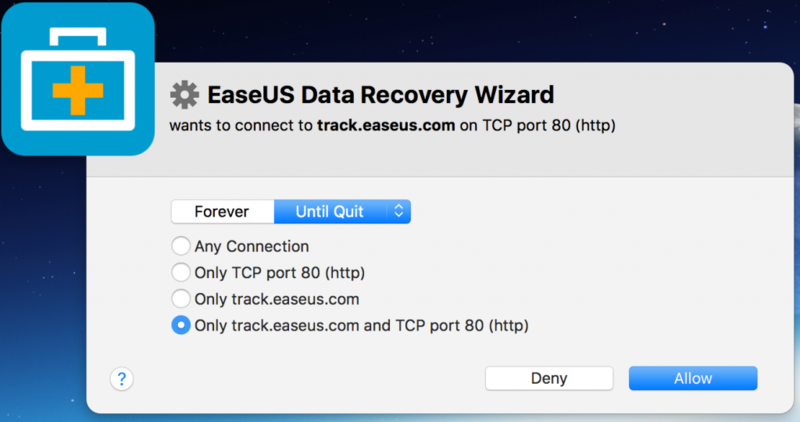 For starters, Little Snitch reported outbound connections to track.easus.com. I could understand the need to reach out and check the license key, but over port 80? The subdomain “track” indicated that this was collecting some sort of metrics. I’m not sure I feel OK about that, especially over an unencrypted connection. Hmm…another non-SSL connection to their website. I would hope that a company charging $90 for an application would be able to (and be smart enough to) get an SSL certificate to encrypt these connections, thereby helping protect their customer’s privacy. 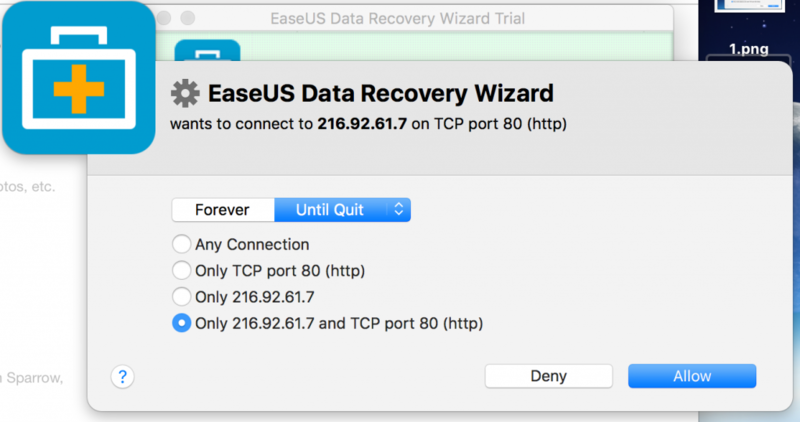 EaseUS doesn’t seem to care about encrypted data transfers. Not good! The last complaint about the installation process is that I was left with a new taskbar widget that looked like a weather alert. 35 degrees? What is that? Turns out this is a widget that provides “S.M.A.R.T.” monitoring of my drives. I’m not sure what that acronym stands for, but this widget was added for me without my knowledge, and it was promising to monitor my drives for issues. I decided to disable it since I am not a fan of widgets being added for me without asking. At this point, things got considerably better. The application was a breeze to figure out and use. I was first asked what type of files I wanted to recover. I left all of them checked since I wasn’t sure what all was on my deleted USB thumb drive. Selecting my USB drive, I proceeded. Within a minute I was shown a bunch of files that were recoverable from my USB drive. I was able to choose what I wanted to be restored. After that, all it took was clicking the Restore button, and I was asked where I wanted to save everything. Another 2 minutes later, I had all my files back! I’m not sure why I’d want to Tweet about that or “share my happiness” on Facebook, but I was given that option when the operation was complete. MP3’s worked, images were viewable, and everything was good. I did notice a few filename characters had been replaced with a “#” sign, but they still operated normally. The EaseUS software did exactly what it said it would do. All in all, this is a good product based my testing experience, and I’d recommend it if you need to recover data from a computer or external drive. There are some installation shenanigans to be aware of, as the software tries to install its monitoring widget without your consent. 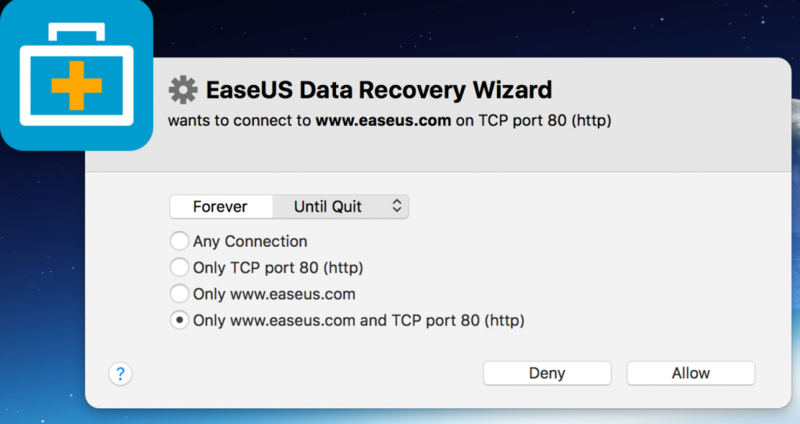 The worst part of it all is that the outbound calls to easus.com are not encrypted. EaseUS: get your stuff encrypted, please!